STANFORD, CA – In an attempt to capitalize on the SEO-rich Star Wars brand, this article was written in the span of fifteen minutes and hastily slapped onto the front of this week’s issue of The Stanford Flipside. Reports indicate that this article will go on to mention several characters from Disney’s revival of the beloved Star Wars franchise, Star Wars: The Force Awakens, such as Han Solo, Luke Skywalker, Leia Organa, Chewbacca, R2-D2, and C-3PO, as well as brand new characters Finn, Rey, Poe Dameron, BB-8, and Kylo Ren. This article could not be reached for comment, as it is a collection of predetermined words and is not, itself, a living being. Whether or not it would wretch at the emptiness and futility of its own existence (that is to say, as a dry husk built to house the words “star” and “wars” together as Star Wars), is a question best left to our philosophers and to our God. 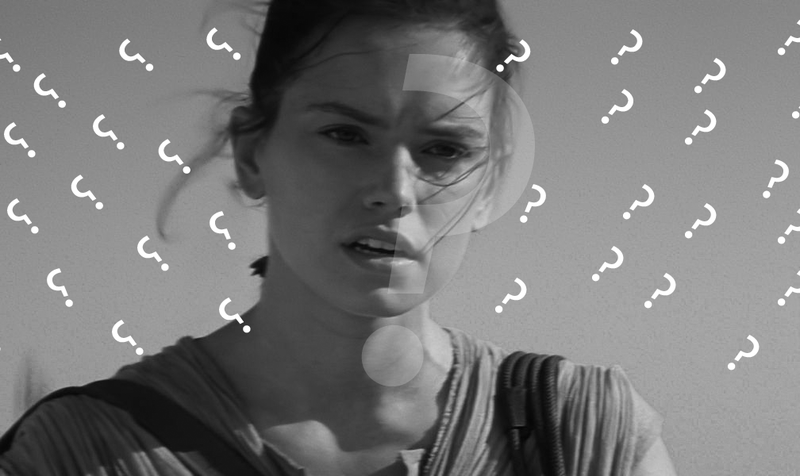 In an effort to subvert and distract from its necessarily honest title, this article will be accompanied by a picture of lead character Rey (from Star Wars: The Force Awakens) staring through a field of question marks.